I thought I'd share an e-mail I received this week from a young man in Germany who is searching for some winter training advice. I love in Boulder, Colorado and we have been under a state of emergency due to all of the snow we have gotten lately. My point is... I feel your pain. Here are the activities I rely upon during the winter months to stay active and motivated. By the way, guys live here who are preparing for the Tour de France and do the very same activities. One such rider is Michael Barry of T-Mobile. 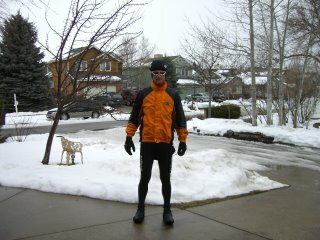 -Cross Country ski- I sometimes combine workout modes and ride to the ski trails on my cross bike then ski afterwards. 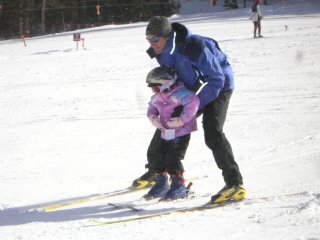 I also make it a family outing by meeting my family at the ski area after I ride up. You can do the same. Maybe ride to a trail head and then go snowshoe with your family. 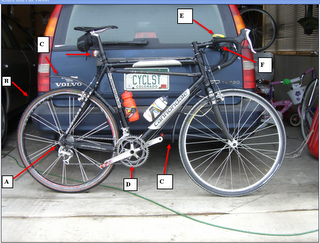 -Cyclocross bike- This is a must for almost any road cyclist who lives north of Texas. -Run- Take it easy. Ease into running if you have bad knees. -Hike- go for long hikes. 3+hr hikes are great for cyclists. -Weight lifting- pretty much a must for any cyclist who wasn’t a college football player. -Ice skate- super workout and much like skate skiing. -Get a cross bike. This allows you to ride outdoors even when the roads are wet and snowy. I have done about 90% of my rides on my cross bike this December. Cross bikes can also be bought at pretty good prices. My Cannondale was $1200 retail. -(B) Get the biggest cross tires you can buy. 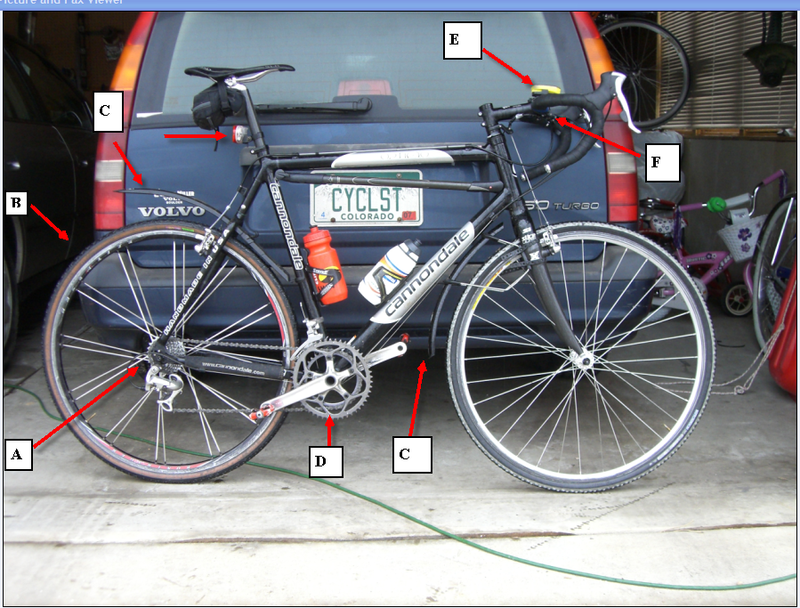 -(C) Get fenders for your bike- this will allow you to ride much longer when it is wet. -(D) I love my compact crank with a 34-50 in the front. -(E) I try to always ride with a power meter and it tends to be a great motivator for me to have a bit of structure even on the coldest rides. -(F) I also love my top mount brakes. It can really help on single track or on step descents when you want as much weight on the back wheel as possible. -I have been using a Gortex jacket which is amazing in cold/wet conditions. -One hard to find item is a helmet cover. If you plan to ride when it is wet and below 30F it is worth the effort to track one down. -My booties are also hard to find. I have some weird ones I picked up from Pearl Izumi Japan. They aren't sold here in the US unfortunately but they are the best I have found for wet conditions. The biggest issue for me in booties is they need to be water proof more than insulated. As long as I am dry I am good to go. Another important factor which makes a bootie good or bad is the seal on your ankle/lower calf. This area needs to have some kind of strap to seal out the water. -Gloves- Descente makes great winter gloves. -Neck gator- life saver when it comes to cold descents. Get out there and have fun in the white stuff! 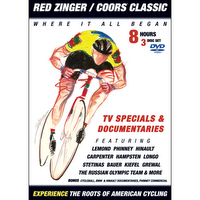 "I'd Kill 'em with My Flipflops On"
Check out this great video of the leprechaun Alan McCormack talking about his days racing in the Coors Classic and how he still enjoys racing against the best in the US (Alan, age 50, still wins pro 1-2 races in Colorado). Sorry it has been a while since my last post. This sounds a bit like a confession, but in fact everything has been positive. Things are progressing better than can be expected with the T-Mobile team. The riders are hitting it hard and starting to put their Training Peaks and WKO+ software throught it's paces. It is always motivating to know some big names in cycling and triathlon are using a product developed out personal passion. We'll have plenty more surprises for you, and I hope to release some data soon from the team. What a fun year 2007 will be! Personally my Performance Manager Chart is chugging along. My Chronic Training Load is at 59 points. Last year at this time my CTL was only at 30points so I actually feel very good about things. 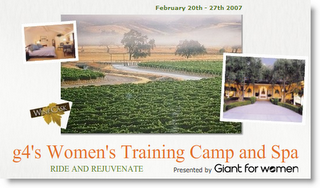 One of the projects I've been working on lately is a women's training camp organized by g4 Events. My (and TrainingPeaks') opportuntity to work with this incredible camp came by way of Dede Barry. I've been training quite a bit with Dede's husband Michael Barry (more on this to come) who is a T-Mobile professional. During one of my rendevous at their house in Boulder Dede inquired if I'd like to be involved with a women's only camp she was helping to organize in Santa Barbara's Wine Country. How could I say no! Not only is this a camp held in a top-notch spa resort in wine country, but the camp is being held during the Tour of California. Talk about a dream come true! It is also a pleasure to be supporting a camp along with the likes of Giant bikes and Power-Tap.